cornis an excellent source of good fiber source at 4.6 grams of fiber per cup, plus it provides vitamin C and the mineral manganese. 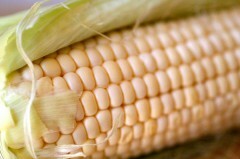 Corn's phytonutrients have anti-oxidant qualities. Corn is similar to a whole grain with some produce like properties, including natural sugars, and as such should not be considered a vegetable or fruit in the diet.